In this lesson we will talk about external parameters of our strategy. User needs to change parameters of strategy, for example on which currency this strategy should work, or what stop loss it should use for orders and so on. RegOption - this procedure creates new parameter. AddSeparator - just adds horizontal separator to parameters' dialog to separate one group of parameters from another. AddOptionValue - this procedure adds new string value to parameter of type ot_EnumType to create drop down list of strings. 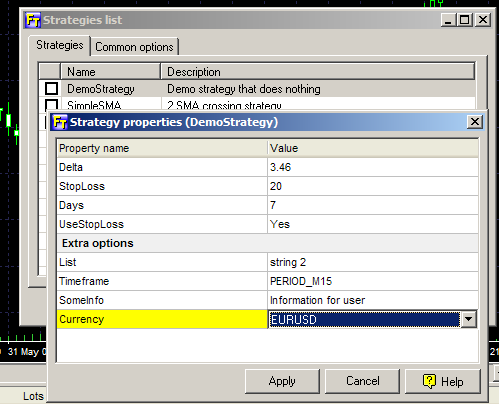 SetOptionRange - if you want to check user input for correct values you can set range of values for a parameter. Only for longword, integer and double parameters. SetOptionDigits - defines how many digits after point you will see in dialog. Only for double parameter. 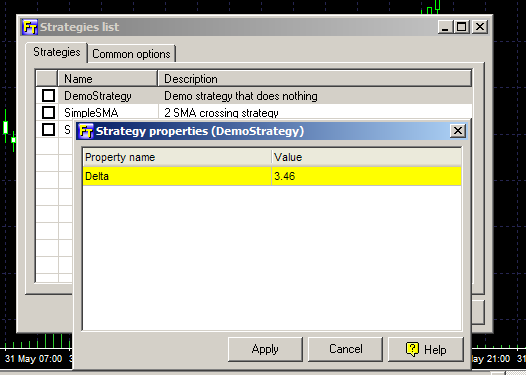 This parameter will be initialized with value of 3.46 on the first start, after that this value will be stored in ini file for this strategy automatically. Simple, isn't it? With RegOption we created new parameter 'Delta' of type ot_Double and linked it with variable Delta. With SetOptionRange we defined that this parameter can vary from 0 to 100. With SetOptionDigits we said that we want to see only 2 digits after point in parameters dialog. If you do not want to do extra job, you can omit SetOptionRange and SetOptionDigits. 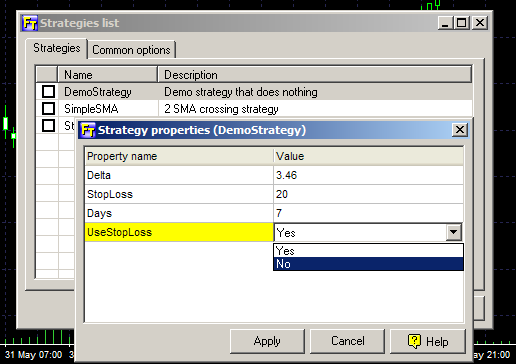 In this case ForexTester will not control the range and use 2 digits after point by default. Last edited by Terranin on Mon Jan 26, 2009 3:55 pm, edited 3 times in total. Strings and currency are slightly more difficult, because they require some extra code in DoneStrategy procedure to release their memory and to change its value you should use ReplaceStr function. Last edited by Terranin on Sat Jul 12, 2008 4:47 am, edited 1 time in total. from VS 2008. Any advice? Ahh - turns out the identifier is ot_Double not ot_double. Small typo there. I just follow lesson 2 to biuld DemoStrategy.dll by delphi. everything seems good but the Curreny list is empty. the curreny pair names wont appear! whats wrong? aafx wrote: I just follow lesson 2 to biuld DemoStrategy.dll by delphi. everything seems good but the Curreny list is empty. the curreny pair names wont appear! whats wrong? Can you see currencies in Testing Mode? Did you click on Currency list in strategy and it shows you empty drop down list? I don´t know what I am doing wrong, as I am copying from your program code, and Delta is a Double type parameter (doesn´t need ReplaceStr function built on it). Do yo know if there is anything I could do to solve this problem? You copied the code of the strategy from this page? Is it Delphi or C++ code? 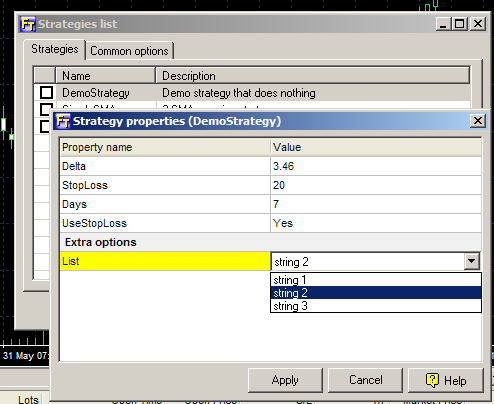 What program to compile strategies do you use? I copied from this page in Delphi. I used Lazarus to compile. Worked fine for lesson 1 (no external parameters at that moment). The problem arised when I included the first external parameter. Unable to rename C:\program Files(x86)\Borland\Delphi7\Projects\DemoStrategy1.$$$ to C:\program Files(x86)\Borland\Delphi7\Projects\Demostrategy1.dpr. [Error] RLINK32: Error writing file "DemoStrategy3.dll"
I can see the DemoStrategy3 file in the file open menu of Delphi7, but if I go with my windows explorer to the directory where there should be the DemoStrategy3.dpr file saved (path c:\Borland\Delphi7\project), the file is not there. I seems it can not read the file when the software tries to compile the file. Do you know if there is anything I can do to fix this problem? It seems that the issue is with the structure of the project, maybe some components were renamed or corrupted. I also received the RLINK32 error. When I looked in the Delphi project for through Windows Explorer I could not see the DemoStrategy.drp file. However, when looked through the Delphi program (File -> Save Project As) I could see it which was strange. So I just changed the security levels for the Boland folder in the Program Files folder to Full control for my user id and it worked. It was just a security/permissions issue.